The TEM that we have, the Jeol 2000fx is equipped with two extra detectors, one secondary electron detector, i.e. 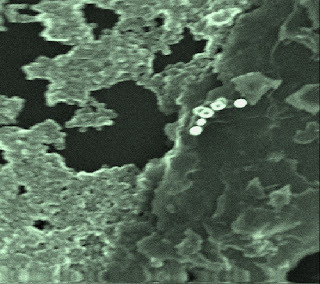 SEM imaging, as well as a STEM detector at the bottom of the microscope. 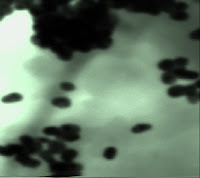 Because the system are from the 80's the imaging from these detectors is (read "was") accomplished by using photographic film to copy the image shown on the CRT. An extra CRT monitor specifically used for this task is located in a free standing box in which the camera with light sensitiv polaroid film is attached to. Nowadays, everything is digital, and polaroid imaging is therefore not very user friendly or timesaving. Besides, one of the two CRT's used for setting upp the image to be captured is broke in our system and the other one is almost burned out... -Time to move into the next century of technology. By different means I found out that the ASID panel, i.e the one that controls the scanning of the electron beam during SEM/STEM imaging, has a extra contact hidden behind the backpanel, labeled SG6, figure 1. Figure 1, After opening the back-panel of the ASID unit the signal generator card (SG) is somewhat exposed as well as the extra contact SG6, used for external scan control. 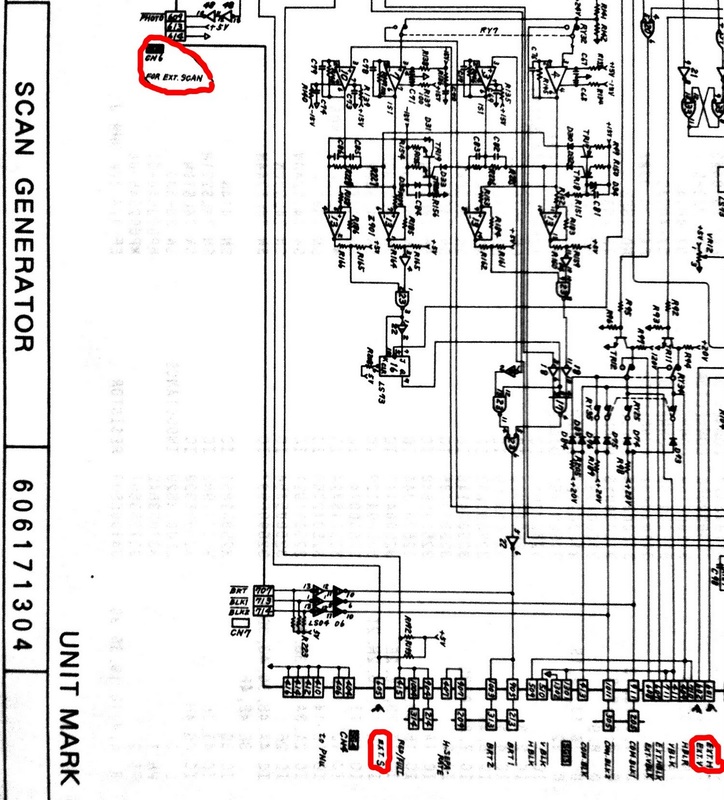 If one looks at the circuit diagram, figure 2, one can se that the external scan mode is activated by connecting pin 5 of the SG6 to ground. This mode bypass the scan generator function of the ASID panel and allows you to insert your own scan signals at pin 1 and 2 for horisontal and vertical. The signal level happens to be ±10 Volts and this is lucky thus the PXI-6229 card that I use for this task also has this amplitude range limit. To connect to the SG6 I assembled a signal cable from SG6 internally to the front of the ASID, a switch was used to connect pin 5 to ground, and the horisontal and vertical scan signals got two SMB panel connectors, se figure 3. 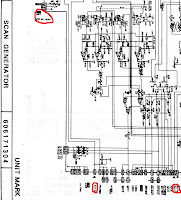 Figure 2, the circuit diagram, the essential connector pins for external scan mode is marked with red. Click image to enlarge it. figure 3 There was one free slot on the ASID front-panel that I used for the switch and connectors. (left) the backside of the ready made front-panel and the frontside of it (right). The detectors each have BNC connector output I just simply detached the regular cables to these ones and connected my own that leads to the same DAQ-card as mentioned above. This electronic setup will results in that the ASID unit will just handle signal conditioning between my DAQ-card and the beam-scan coils, the two (three) CRT's will no longer be needed. The only buttons on the ASID panel in use will be stigmatism correction and detector contrast setting. What you want to do is to get LabView to generate two signals, two sawtooth for horisontal and vertical synch signals. I configured this as a single DAQ-task where both are written at the same time to avoid conflicts on the hardware. During signal generation you also need to collect the detector data, this I configured as a parallel task to one the above. You have one options here and that's to read data faster than you write, this will improve signal noise ratio for you and I made this option as a user "scan speed" selection in the program. I always read data as fast as possible, 200kHz, and depending on what slower scan speed setting one choose, more samples are read for each position on the sample. You also have another option here and that is to scan one horisontal line then collect the data from the detector or to read the hole image in one sampling. The former gives you ability to handle bigger image sizes, i.e. beyond 512x512 pixels images, because you only need to have one scan line in the DAQ-card buffer each time. The later alternative is of-course much faster. I choose to implement booth, the one-line scan mode for final imaging and the hole-image scan mode for fast preview as this gives you almost 2 frames/s in 128x128 pixels. As a final option for improving signal to noise ratio I also made integration over several imaging, i.e. adding images together, as an user option. To test out the new system configuration I inserted a sample of gold-nanoparticles roughly 50nm in diameters, located on a standard TEM grid. Figure 4, TEM image of gold-nanoparticles (left) and STEM image of the same, but rotated 90° CCV (right). 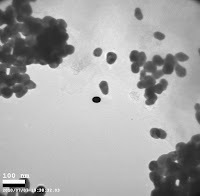 Due to the in-situ probing that we usually do in our setup we can measure the impact beam current of the sample during SEM scan and make mapping of this as well this is yet to be done and I report on this later.